We are huge fans of The Flaming Lips & if you have never heard of them before we highly recommend you take a listen. Formed in Oklahoma City, Oklahoma in 1983. Instrumentally, their sound contains lush, multi-layered, psychedelic arrangements, but lyrically their compositions show elements of space rock, including unusual song and album titles—such as "What Is the Light? (An Untested Hypothesis Suggesting That the Chemical [In Our Brains] by Which We Are Able to Experience the Sensation of Being in Love Is the Same Chemical That Caused the "Big Bang" That Was the Birth of the Accelerating Universe)". 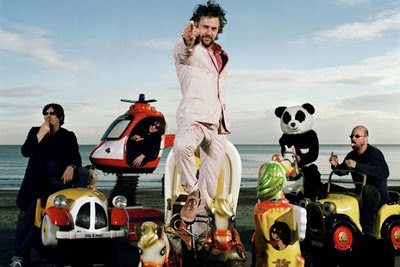 They are also acclaimed for their elaborate live shows, which we are pleased to have been over the years they feature costumes, balloons, puppets, video projections, complex stage light configurations, giant hands, large amounts of confetti, and front man Wayne Coyne's signature man-sized plastic bubble, in which he traverses the audience.."
In an interview with Mojo, Coyne revealed that during the recording of Yoshimi..., band member Steven Drozd was trying to kick a heroin addiction. When they took breaks from playing, Drozd would have a really tough time with his withdrawal. Listening to him cry, and with the death of his father in mind, Coyne wrote "Do You Realize?? ".